Hometown and odds on favourite, Caleb Noble simply outclassed his opposition to take out the event by a comfortable five minutes. Noble was first into the bike transition after a quick 1km dash that spread the field, but it was the 20km bike leg that saw him amass an unassailable lead. With a huge tailwind going out on the bike leg, Noble pushed hard and then pushed through the headwind coming back. Another solid transition and swim leg saw him in and out of the pool before the second placed competitor, Wagga cyclist, Chris Powell entered the water. From this point there was no catching Noble, who crossed the line in a time of 54 minutes and 23 seconds. With 500m being added to the initial run leg back in 2014 to ease congestion in the first transition, Noble’s time stacked up well against the event record of 53 minutes and 42 seconds, which he set back in 2013, and is in fact a new course record. Wagga’s Dan Judd was runner–up, backing up from his second place in the Wagga event the previous week. Judd made his move in the pool and enjoyed the longer run leg to finish two minutes ahead of Andrew Bruce of Wagga in third place. 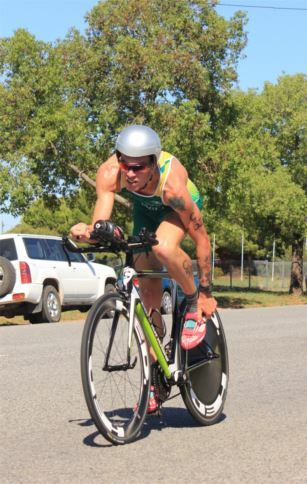 Reigning Riverina Tri-Series winner, Ben Cattle finished in fourth place ahead of his West Wyalong counterpart, Angus Westaway. In the women’s field, Briony Mazzocchi, of the Rock, took out the event for the first time, finishing in a time of 1 hour, 9 minutes and 27 seconds, and alongside her husband, Michael Mazzocchi. Mazzocchi, who grew up in Ganmain, enjoyed strong crowd support and was a deserving winner, coming in 19th place overall. Sarah Finley of Morven, a regular competitor at Ganmain, came in second place, only thirty seconds off the pace of Mazzocchi and forty seconds ahead of third place getter, Georgia Booth of Ganmain. Two teams also competed in the Open Event with Charlie and Tim Wykes of Coolamon winning ahead of the Love-N-Waugh team of Caroline Love, Lisa Saffrey and Jude Waugh of Wagga. Charlie was competing in his second event for the day, after taking out the Junior race and Tim managed to recover from a fall in the bike leg to secure their podium finish. First locals across the line were Jason Hamblin and Georgia Booth. The TRY-a-triathlon race also saw a record number of 28 participants take on the challenge of a 500m run, 5km cycle, 100m swim and 2km run. Winnie Lawrence of West Wyalong was the first athlete home in a time of 27 minutes and three seconds. Runner-up in the female section was Molly Radley of Collingullie, competing in her first triathlon, and third place was Rachel Christmas of Temora. 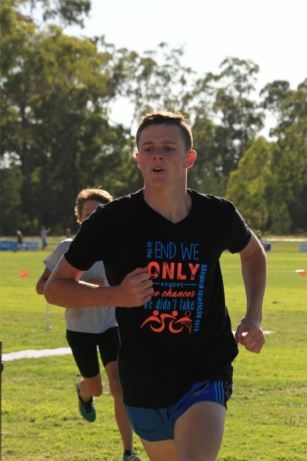 In the mens’ category, young Lachlan Macmaster of Tumut clocked in first in a time of 29 minutes and 38 seconds, ahead of David Currie of Matong and David McEnally of Wagga. 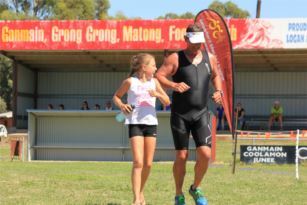 The Clark Crew of Ganmain, comprising of siblings Jeff, Jennaya and Chloe, crossed the line in sixth place overall and a time of 28 minutes and nine seconds, to take out the teams category. The Junior event saw a field of 50 individual competitors and a single team vie for glory. This was a hotly contested event with Charlie Wykes (12) of Coolamon just edging out Jesse Tenhave (14) of Ganmain. Wykes’ winning time was 24 minutes and 52 seconds, fifty seconds ahead of third place getter, Harry Trevaskis of Wagga. Racing as a top age, 14 year old, Tenhave looked strong and showed great speed throughout the race. Tenhave was first on and off the bike and was followed into the pool by Trevaskis, Matt Hamblin (Ganmain), Sam McEnally (Wagga) and then Wykes. Wykes managed to overtake McEnally in the pool, but still had three ahead of him going into the final run leg. Giving away close to a 150m head start to Tenhave on the run, Wykes was able to round up Trevaskis and Hamblin relatively early in the run leg, before catching Tenhave around the half way point. Wykes made his charge, but Tenhave was able to up his pace and keep with him before making his own charge near the Ganmain Public School, sprinting ahead of Wykes. At this point, Wykes elected to stay with him and hold everything to the final charge, seizing the victory over Tenhave on the line. It was an incredible finish to a very high calibre race and bodes well for the future of the sport locally. Abbey Hamblin (10) of Ganmain was the first girl home, pipping Lucy Macmaster (12) of Tumut in the final run leg. Hamblin improved on her third place from the previous year and was in 8thplace overall. Macmaster was 9th overall and improved on her 2015 time by over a minute and a half. Both girls have a few years left in the event, with many more closely-fought battles no doubt yet to come. Amy Combs (11) of Wagga finished in third place. 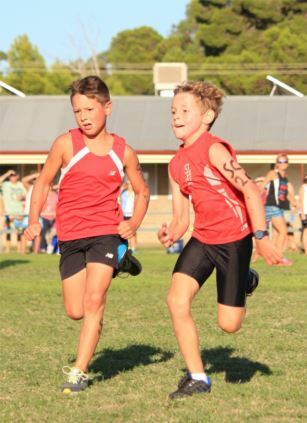 Seb Hamblin (Ganmain) and Luke Mazzocchi (The Rock) were the first and second boys home respectively in the 11 years and Under category of the Junior race. Abbey Hamblin and Combs were the first and second girls home in the same age category. The ever-popular Sub Junior race, saw 37 competitors undertake the 400m run followed by a 1.5km ride and then a 300m run. 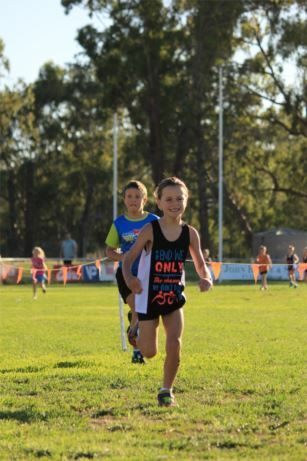 Seven year old Kaden “Kado the Tornado” Lander of Wagga went after it from the start, continuing his good form from the Wagga event. Unfortunately a mishap on his bike saw him come unstuck. He none-the-less got back on his bike and finished strongly to come in fourth place overall. Last years’ runner- up, Nate Hamblin of Ganmain then went head to head with the 2015 winner, Lucas Hatty, also of Ganmain, for line honours. The boys put in a sprint finish in their last year in the sub-junior event, leaving nothing in the tank, with Hamblin just prevailing. Digby Currie of Matong also put in a solid race to earn himself third place. Olivia Flynn was the first girl across the line in the Sub Junior race, followed by Sophie Lange and Charlotte Seghers respectively, all of Wagga. Lange was also the first Under 6 female home, ahead of her peer, Ashley Crossett of Wagga. Rubin Evans and Fletcher Gregurke were the first and second Under 6 males home respectively. The effort, determination and sportsmanship of all these competitors was commendable. Well done to all our young competitors. Last but certainly not least, the 4.5km fun walk was enjoyed by over a dozen people. Raffle winners were: 1st prize – Steve Trevaskis, 2nd - Trent Richards, 3rd - Karlie Pieper. Congratulations to all those who participated in the event, cheered on friends and family and volunteered their goods and services to make it all happen. Once again, the day was a huge success with record numbers and incredible community support. The scene is now set for the third leg of the Riverina Tri Series in Temora this weekend. For more information about times and age category winners please visit the Triathlon website. If you attended the 2016 event, please feel free to share your photos on Facebook or instagram using #VisitCoolamonShire.